ConceptDraw DIAGRAM diagramming and vector drawing software extended with Fishbone Diagrams solution is a perfect tool for software designers and software developers. 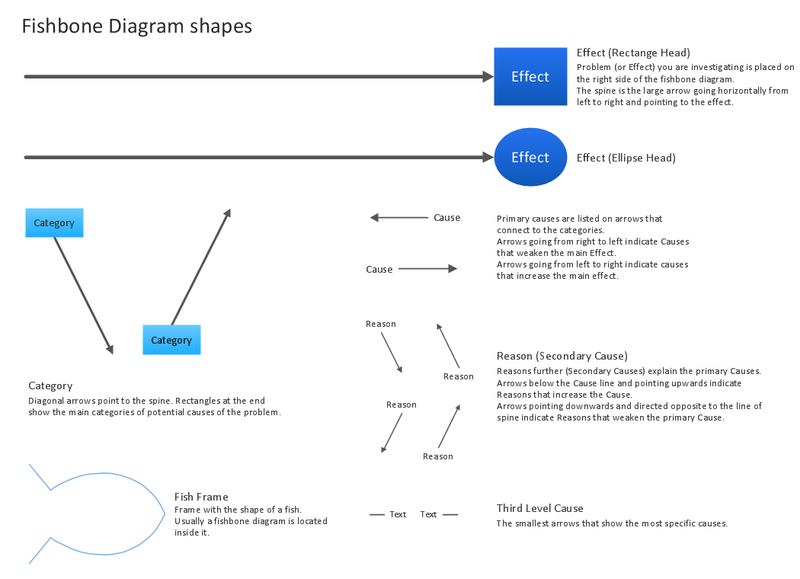 If you need to create Cause and Effect diagram, Fishbone diagram, Ishikawa diagram from templates and examples, or using the predesigned elements, ConceptDraw DIAGRAM can do this easily. ConceptDraw DIAGRAM software gives ability to design Fishbone diagrams that identify many possible causes for an effect for problem. Each Fishbone diagram design element included to Fishbone Diagrams library is vector and ready-to-use. Turn attention for the variety of vector elements predesigned and offered by Fishbone Diagrams library. 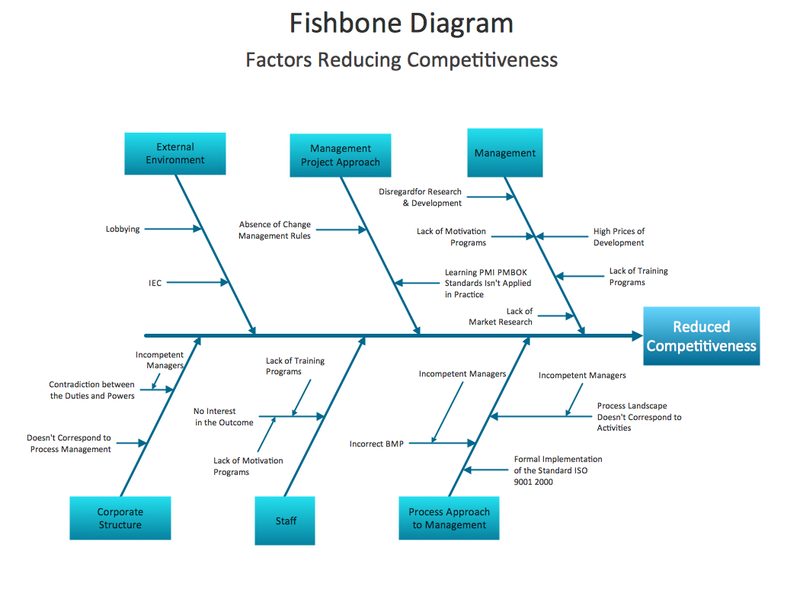 The first step that you need to do when designing a Fishbone diagram is to draw the fish's backbone with a head. In ConceptDraw DIAGRAM simply drag ready backbone object from the library, if needed you can change the lenght of backbone line dragging the green handles on it. Then attach the categories elements to the backbone using connection dots, add the causes elements and type the text. Finally you can add the fish frame fishbone diagram design element and recolor your diagram. Often for defining causes are used brainstorming sessions. The ConceptDraw Office innovative toolset is also helpful at this question, it offers the specialized ConceptDraw MindMap application for easy brainstorming. Having resulting Mind Map you can then easy output it as ready Fishbone diagram in ConceptDraw DIAGRAM for further work with it. 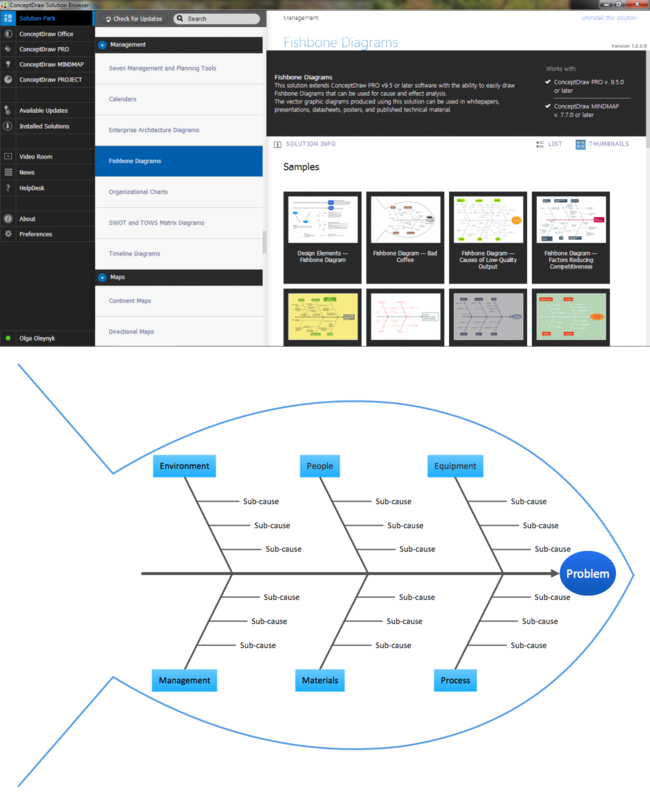 You can also use ready samples or templates offered by Fishbone Diagrams solution in ConceptDraw STORE as the base or as the source of inspiration for your own diagrams. The samples and templates you see on this page were created in ConceptDraw DIAGRAM using the Fishbone diagram design elements from the Fishbone Diagrams library. They successfully demonstrate solution's capabilities and professional results you can achieve using it. An experienced user spent 10 minutes creating each of these samples. Use the Fishbone Diagrams Solution for ConceptDraw DIAGRAM Solution Park for easy and effective cause and effect analysis. Creating of Entity-Relationship Diagrams (ERDs) is a complex process that requires convenient, automated tools. ConceptDraw DIAGRAM v12 diagramming and vector drawing software offers a powerful ER Diagram Tool - the Entity-Relationship Diagram (ERD) Solution from the Software Development Area.